This trick was performed in David Blaines second special where he made the spectator sign a card, the card was put back in the pack and was made to appear from between two aces. The only real skills necessary are good verbal communications and misdirection. Richard Marcus a renowned card cheat always emphasized the importance of misdirection. It was an invaluable tool as all of his casino moves have their foundation in this technique. 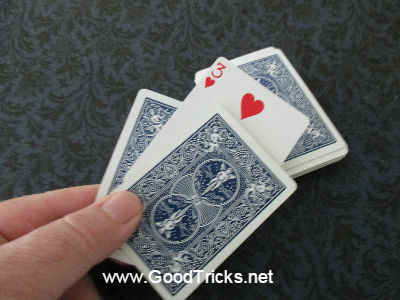 This page will show you how to do a great version of David Blaines card trick. Secret: Give the spectator, the two red aces and tell them to hold them. Fan out the deck and tell the spectator to touch a card. Square the deck up leaving their card stuck out to be signed and shown. Now you secretly put the card into " palm position " when you square up the deck so you can easily palm the card when you want to. It must stick out of the lower corner of the pack meeting your inner thumb. Let them sign the card and then hand them the deck, secretly palming their card. After they are convinced that the card is well lost in the deck, ask for the two aces and sandwich the face down palmed card between the aces, showing only the aces face up. Tell them to watch their card rise from the deck into the two aces. Shake a little more loosely and watch as to their amazement, their signed card appears from between the aces.